On October 29, the UAE made history, launching the first satellite made entirely in the country with Emirati engineering expertise. 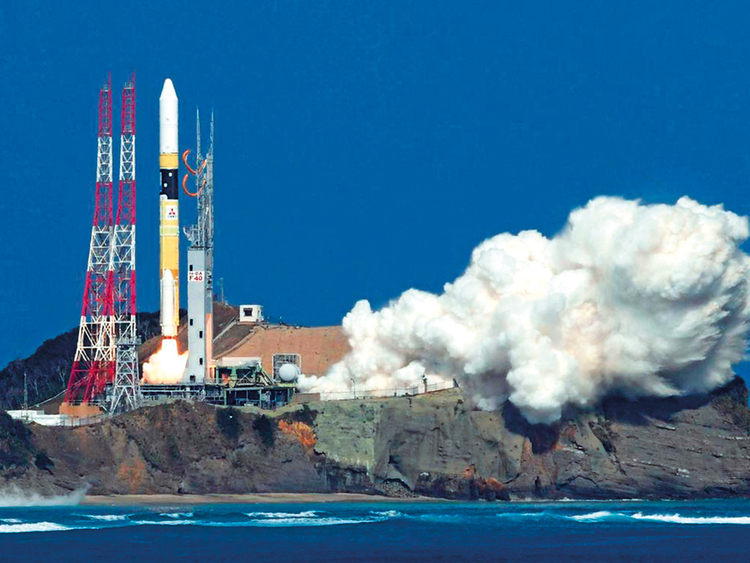 As the remote sensing Earth observation satellite launched into space on board the H2A from Tanegashima Space Centre in Japan, KhalifaSat represented a giant leap in the UAE’s aerospace ambitions. KhalifaSat coincided with another launch by the UAE Space Agency, of its comprehensive strategy for investing in the UAE’s space sector. Speaking to the Emirates News Agency, WAM, Dr Mohammad Nasser Al Ahbabi, Director-General of the UAE Space Agency, said that increasing the contributions of the space sector to the national economy is a strategic goal. Dr Al Ahbabi said the total value of Emirati investments in the space sector had increased from Dh20 billion in 2015 to more than Dh22 billion during 2018 and that the space industry is a key driver of the country’s economic growth, especially satellites and related services. To regulate the industry, the UAE Cabinet recently approved a federal space law, the first legislation of its kind in the Middle East. Legal expert Sunil Thacker, a senior partner at STA Law Firm, says the new law symbolises a monumental triumph for the nation’s space sector. Thacker has been on several committees assisting the UAE government in the drafting of local laws and regulations. “It’s inevitable that investment in the space sector will surge, but how the legal implications of investment will work in such context is the golden question,” says Thacker. The signing of the law was followed by an agreement between Nasa and the UAE Space Agency facilitating training of UAE astronauts, access to the International Space Station, and involvement in lunar exploration. “It will be interesting to follow how this bilateral affiliation develops, and how the opportunity impacts the development of the UAE space sector and its laws,” says Thacker. The agreement allows the first two Emiratis to join a UAE astronaut training programme, in preparation for one of them to be chosen to become the first Arab in space in April 2019. Hazza Al Mansouri and Sultan Al Niadi were recently selected from more than 4,000 candidates to train for a ten-day mission to the International Space Station on board the Soyuz MS-12. The training programme is part of the UAE National Space Programme, an ambitious 100-year plan to propel the UAE to a position of leadership in global space exploration. Its objectives include the 2021 Emirates Mars Mission — Hope and the 2117 Mars project to create the first human settlement on the red planet. To support these goals, the UAE must ensure it has the expertise to carry out its ambitions. Lissy Donald, Managing Director of Compass International, which partners with the UAE Space Agency to organise space camps and other educational opportunities, says the UAE government is heavily investing in training the next generation to be ready for every kind of space exploration. “I have taken thousands of students for various space adventures around the globe, and I see a very bright future for the UAE youth in this particular sector,” says Donald. Last year, Donald hosted the inaugural UAE Space and Rocketry summer camp in Dubai for hundreds of students from the UAE, Saudi Arabia and Bahrain. “The students had direct access to space veterans such as Nasa astronauts and engineers to ask questions and obtain first-hand information,” she says. If imagining the future of the UAE space industry, it may look very much like 12-year-old Dana Al Beloushi. In 2015, as a nine-year-old, Dana travelled to Houston, Texas and became the youngest Emirati to receive training at Nasa. Dana also attended a two-month space camp in Alabama with her equally prodigious brother Adeeb — a renowned Emirati inventor himself at only 14 years old. Now Dana has signed her first book deal on the achievements of women in Arabia. She recently told Euronews that one of her favourite parts of her book deals with how Shaikh Saif Bin Zayed Al Nahyan discovered her at the UAE Pioneers event. “I promised him that I would become better than Adeeb and nine months later I graduated space university in Nasa. I received eleven certificates and two gold medals and he was very proud of me,” said Dana. Another opportunity designed to foster an interest in space among young people in the UAE is the Genes in Space programme held here last year, for the first time outside the United States. “Five teams and eight young scientists were chosen as finalists in the inaugural Genes in Space competition in the UAE,” says John Elbon, who oversaw the programme for Boeing at the time and is now on the Board of Directors for the Coalition for Deep Space Exploration. Students will one day be making ground-breaking discoveries that will enable humans to explore further than ever before. Genes in Space allowed students from Abu Dhabi, Dubai and Al Ain to solve real issues encountered in space. “Like Anannya Sivakumar and her group who proposed an experiment to investigate ways to reverse the negative effects space has on astronauts’ neurons,” says Elbon. Alia Al Mansouri went on to win the competition and her experiment to see if heat-shock proteins can protect cells from DNA damage under the stressful conditions of space was launched into space and carried out on her behalf in the International Space Station by astronaut Peggy Whitson. “Students like these will one day be making ground-breaking discoveries that will enable humans to explore further than ever before,” says Elbon.